State budget collection was estimated to reach almost 1.4 quadrillion VND ND (60.2 billion USD) this year, 6 percent higher than the estimate, Minister of Finance Dinh Tien Dung told a teleconference between the government and localities cities in Hanoi on December 28. The national flag carrier, Vietnam Airlines, has reported that its revenues in 2018 are estimated to hit 73.3 trillion VND (over 3.1 billion USD), meeting 99.8 percent of its set plan. According to LEFASO Secretary General, Phan Thi Thanh Xuan, from January to November, the country earned US$14.61 billion from footwear shipments and US$3.07 billion from the export of suitcases and bags, up 10.9% and 3% from a year earlier. As many as 550 pieces of a steel-pellet bomb used by the US army during the war in Vietnam have been safely removed from the land plot of a family in the northern province of Hai Duong. The HCM City court on Friday ordered ride-hailing firm Grab to pay VNĐ4.8 billion (US$210,300) worth of compensation to local taxi firm Vinasun. Local authorities are facing mounting difficulties in managing imported scrap as many scrap importers have refused to cooperate in dealing with the numerous scrap containers piling up at ports, said a General Department of Vietnam Customs official. Thousands of tons of ash and slag from Mong Duong 1 Thermal power Plant in Cam Pha City of Quang Ninh province was dumped into the environment early this month. The new 15-MW reactor may be located in Lam Dong or Dong Nai provinces. Vietnam’s exports have become more sophisticated with an impressive diversification of exports and increases in higher-value manufacturing exports, according to a recent World Bank (WB) report. A Vietnam Airlines Airbus A321 carrying Vietnam’s Prime Minister Nguyen Xuan Phuc and government officials made the first touchdown at the Van Don International Airport near the world-famous Ha Long Bay on Sunday morning, marking the opening of the first private airport in Vietnam. 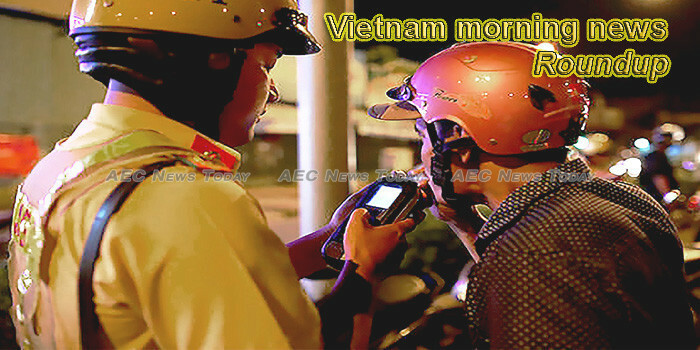 Ho Chi Minh City’s Department of Transport has added more patrols to handle traffic congestions during the holiday season. The 11-member Comprehensive and Progressive Agreement for Trans-Pacific Partnership (CPTPP) officially came into force on December 30, creating a free trade area covering more than a tenth of the global economy. The People’s Procuracy of Hanoi city has completed the indictment to prosecute Nguyen Huu Tien, born in 1983, residing in Thuong Tin district, for the charge of violating regulations on the protection of endangered and rare animals under Article 244 of the Criminal Code 2015. Vietnamese Ambassador to Egypt Tran Thanh Cong has affirmed that eight out of 12 Vietnamese people who were injured in the recent bomb attack in Cairo have completely recovered and could return home. Hundreds of households in Ho Chi Minh City have been benefiting from homegrown solar power systems. Prime Minister Nguyen Xuan Phuc attended the launch of the Van Don International Airport, Ha Long International Passenger Terminal, and Ha Long-Van Don Expressway in the northern province of Quang Ninh on December 30. Ngu Hanh Son (Marble Mountains) landscape site in the central city of Da Nang has been recognised as a national Special Relic, one of the 16 approved by the Prime Minister recently. Viet Nam’s insurance industry achieved high year-on-year growth of 24 per cent in 2018, the fifth consecutive year the industry posted annual growth of more than 20 per cent. A oyster breeding project in the Mekong Delta province of Kien Giang which is part of larger effort to preserve and regenerate natural aquatic resources on Phu Quoc island has seen positive results, according to the Phu Quoc Reserve Management Board. Six men in Vietnam were busted this week for killing and eating an endangered monkey — and livestreaming the gruesome event on Facebook, according to a report. Vietnamese defense officials have reaffirmed Việt Nam was forced to use its just right of self defence in the war against the genocidal Khmer Rouge regime. This week’s morning news photo focuses on the death, pain, and loss that typically occurs at this time of year on Asean roads due to drunk driving, speeding, and a failure to wear protective helmets when travelling on motorbikes.